Who knew that a beer could change world history? Well, this beer did. 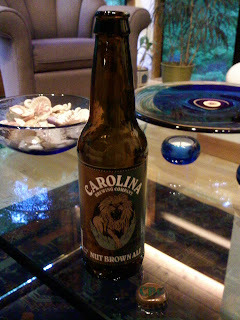 Within hours of enjoying my first Carolina Brewing Company Nut Brown Ale, Obama announced that Osama bin Laden had bitten the dust. Crazy. I never knew that this beer with its brown and nutty taste, 4.7% alcohol content, and stomach-filling ability could bring down global terrorists. That's a great marketing campaign - "Beer so good, terrorists DIE!" This brown ale left a sour, sticky taste in my mouth that lingered for a while, similar to the feeling you get after you brush your teeth (if it were beer-flavored toothpaste). It is brewed in Holly Springs, NC, and it just so happens that all of the NAVY SEALS that brought down Bin Laden hail from Holly Springs! I made that last part up, but if it were true, that would be one hell of a coincidence. I picked up one of these for the great price of FREE at a potluck dinner, which is a bargain, but I think they can be had for ~$9 a six pack, which is the typical price for a six-er of local beers. I don't know if I would buy it at the store, but next time I see it for free again, I'll be all over it. To conclude, if you see in the news soon that Muammar Gadhafi has been blown to smithereens, you'll know that I had just enjoyed another average Carolina Brewing Company Nut Brown Ale. USA! USA! USA!